There are so many words written on the topic of Brexit that I was going to just ignore the issue and move on. Especially since I have no vote on the matter. However, I live in the UK now. I pay taxes. And I genuinely love this place. Well, mostly London. But also rest of the country, the bits I've seen. The reason I live here is my Finnish passport. I was born in Russia, but then moved to Finland when I was 15. Thanks to free education in Finland I got my degree, found a job, and did quite well for the next 15 years. Then, thanks to the freedom of movement, I decided to try another country. It is pretty awesome when you can find a job anywhere within EU, move there and start working, with no need for a working permit or any other bureaucratical nonsense. Freedom of movement is one of the essential things in the world, strangely restricted in some parts. If you’re a less lucky citizen of a non-EU country, generally you would have to either stick with that country or spend lots of efforts trying to achieve the same level of movement freedom. UK has always been a bit of a special fruit of EU. My first visit to London was in 2009 when I only had my Russian passport. Application for a UK visa was 36 pages long (not kidding), cost me around 90 euros and an extra day to travel to the UK consulate in Helsinki. Today they don’t even have a consulate in Helsinki - the closest one is in Stockholm, and you'd have to send your passport there, along with the biometric data. Despite all of that, I remembered that feeling of a huge but cosy megapolis where I could settle for a few years some day. It’s been 2.5 years now since I and my wife relocated from Finland. If we talk strictly about British things, it’ll be separate cold and hot water taps, electric shower, full English breakfast, jacket potato - although who am I kidding, I love jacket potatoes here. Fish and chips are less relevant since both of us are vegetarians. But London makes up to you with a diversity of cultures brought by immigrants like myself. Most amazing Turkish baklava, Greek coffee, Sichuan food, falafels. I’m talking food now, but actually, to me, London is a place of acceptance. It is the only place in the world where you can come with your accent, and people will say - “Hey, nice of you to come, what would you want to do?”. No one cares about your accent or being a foreigner here. Even if you're a talking bear, it will not make you special here. What matters is who you actually are, what do you actually want. It’s a place of endless possibilities with the most amazing people around. Again most of the people you’ll meet will be from somewhere else. Either from different parts of Britain or more than often from other countries. London is a place of tolerance. It is not a funny idea you entertain in your mind, read about it in books or watch in movies. You are surrounded by a thousand of different cultures, every time you step out of your house. Tolerance and empathy towards things different from your views and opinions - you just get it, like a level up, after living here for a while. There is literally no other place in the world like this. (Or maybe is, but I haven’t been there). In here you live in constant realisation how diverse people can be. And it’s a good thing. Diversity and tolerance teach openness toward others. In my idealistic version of the world, everyone can freely travel, settle anywhere, and do stuff they want. People are friendly and we help each other. Also maybe a universal basic income for everyone, in case you just don’t feel like doing anything today. Oh, also free food, free unlimited energy, robots building stuff for us. Some parts of this dream are already here, although not evenly distributed. EU managed to provide freedom of moving and settling around a significant chunk of countries. You’ll get free health care, social benefits (if eligible), education and language courses. For me, the idea of helping each other and uniting everyone into something bigger just feels right. Breaking this is the opposite of right. It is highly tempting to compare running a country to running a commercial company. There is, however, a fundamental difference. Countries cannot be run for profit. The main purpose of any country is to provide the best possible environment for its residents. Not pile up money. Not lock down its borders and pretend that there is no one else around. Denial was sort of possible one hundred years ago when communication was largely non-existent, travel was hard and was performed mainly when going to war. Today you can follow up climate change via live HD broadcast from space. This is our planet, it’s the only one we have, no one is getting out of here anytime soon. Denial is a sweet thing, but to me is a sign of ignorance. Running a country like a commercial company has largely messed up our priorities. Somehow we put monetary gains above humanitarian values. This is happening in the age when we all know that money is highly superficial. We have invented it, it is not backed by gold anymore, it is largely made of overvalued mortgages. Yes, we stick to the idea that money is the most important thing - but mainly because we used to this. In my mind money is very much secondary, and today with all the technological advancements we should be able to provide everyone with free food, shelter and stuff. Honestly, today we have enough stuff for everyone. For the first couple of years while living in London we got all sort of stuff from streets, left by people who couldn’t fit it in the (tiny) apartments. London is an amazing place, but it wasn’t like this for always. I think it became highly attractive in the past 5-ish years. Suddenly there are small creative companies changing the historical ways of doing things. This is where you want to be - change the world, play a part of improving it. The only way forward really is to completely dissolve borders, welcome talented people from all around the world, with their cultures and ways of thinking. This is certainly an idealistic view, and surely there will be people who just want refuge. This is again where EU steps in, and a coalition of countries can figure out a way of evenly distributing challenges. Change is good. And we should be able to handle it. It wouldn’t be a problem for me and my wife to move to another country. Let’s be 100% honest - the UK is not on top of the family friendly country list. Today I’d say it’ll be Sweden or Finland. Or even Estonia with their electronic government and a way to pay taxes in 5 mins, online. Full data transparency, a personal chip with a private key for every citizen. Ability to vote online, while enjoying a drink in your country house. I could work remotely too. But there is something here in London that makes me wake up every day, commute for an hour into the city. This something is people - some of the most talented people in the world. Together we are making it better. As one of the founders put it, our tiny company employs people from 20 nationalities around the world. We’re all immigrants here. And all of us will have no problem to move somewhere else, job wise. The world is a big place. But I’d prefer to stay here. London is one amazing place. After a recent move, we’ve found a bunch of Eastern European food shops selling pretty authentic food straight from my Soviet childhood. In many ways London is like Lego - it gives you an enormous amount of bricks, and you can build out of it any life you want. Update: there is an ongoing discussion on Reddit for separating London from the UK and keeping it as part of EU. Update 2: If you haven’t seen the #CatsAgainstBrexit, it will make your day. One of the basic needs when dealing with governmental services for a person is to prove your current place of residency. It may sound trivial, but there are multiple approaches to solving this problem. What is it? 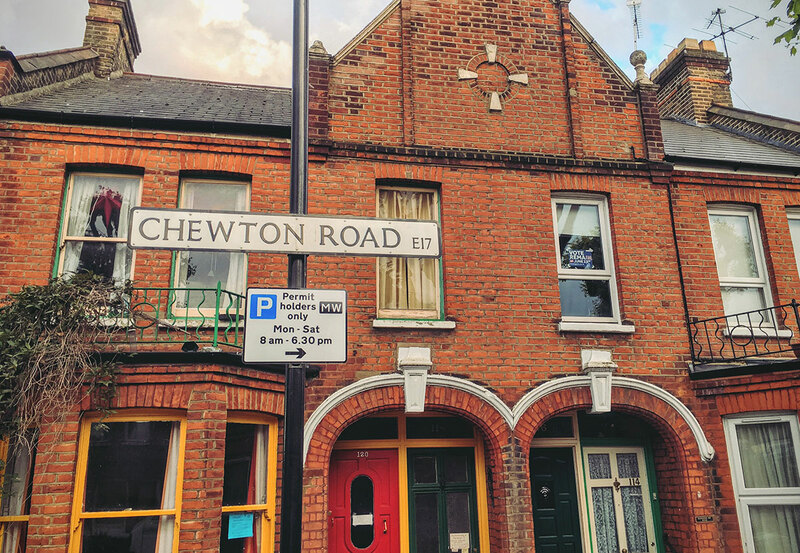 To prove that you are indeed residing at a given address you must provide a council tax or utility bill, with your name on it, delivered at a given address. There is a catch - it should be issued within 30 days or it is not valid anymore. As everything in Britain, this rule was probably a brilliant invention in its simplicity at some point of history. Today, not so much. 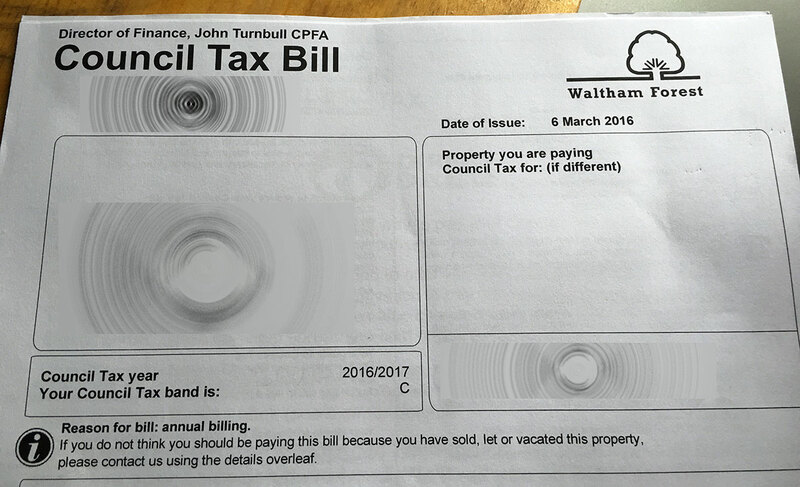 Your local council will mail you tax bill about once a year. Utility bills will be issued at various intervals. However, all my current utility bills are electronic. I pay for electricity and gas directly from a mobile app. This leaves council tax bill as the main source of being one and only available proof of address. In practice, you can make a telephone call and order new council tax bill at any moment. They will generally mail it within next couple of weeks. After that, you have a valid proof of address for the next 30 days. Problem postponed. In Finland, they have a state register with data on everyone residing in the country (as well as citizens living abroad). This register contains your current address, marital status, national security number, and probably a bunch of other stuff. The register is used by the post office to verify delivery address. The same register is used by pretty much every other government agency when they need to verify your residency. When dealing with Finnish banks, the local version of NHS or any other government agency it is generally enough to tell your national identity number. They will check it on the state register and will verify everything else from there. This comes super handy during phone calls - all you need to tell is your private state ID - which is much easier than spelling out your name, address and phone number. Handling things with the Finnish Register Office is also not ideal today. Access to the main database is limited to the clerks only, and the database itself is also not very fast from what I can tell. My dream scenario would be some sort of open repository where I can issue key and authorise 3rd parties to access certain parts of my personal data registered with the state. This repository should be international. For example, today marriage should be registered separately in each state of your residence - and in the case of divorce - unregistered separately. To be fair, this year Finnish Register Office started offering online services - quite a limited subsection of them. They are going to extend the list of online services during this and next years. I’ve got my CV1 order now about 2 months ago and been playing with it semi-actively. It’s a solid piece of experience, it works, and there is good selection of content. In January Oculus did that famous announcement of a pre-order date for a consumer version. They had a countdown on a site. I think it was around 4pm in the UK when it stroke 0:00, and the whole Oculus site went down. Multiple Cmd-R presses, some cursing, and parallel chatting to a friend who also wanted to place his order. Finally, we got through. This was the moment when the price of the headset was revealed for the very first time. There was a moment of hesitation, and then I ordered. A friend hesitated for 5 more minutes and ordered too. Delivery date was set to the late March. The grand total price with UK VAT and delivery fee was around £550. I think in March Oculus announced that the delivery will be delayed. In the end of March, they waived the delivery fee, and new grand total price became about £500. That was a nice gesture I thought. My delivery date was pushed to the end of May. It was beginning of April, and we were about to embark on a trip to Amsterdam. I also suddenly remembered that since the pre-order we moved house and I should probably update the delivery address. 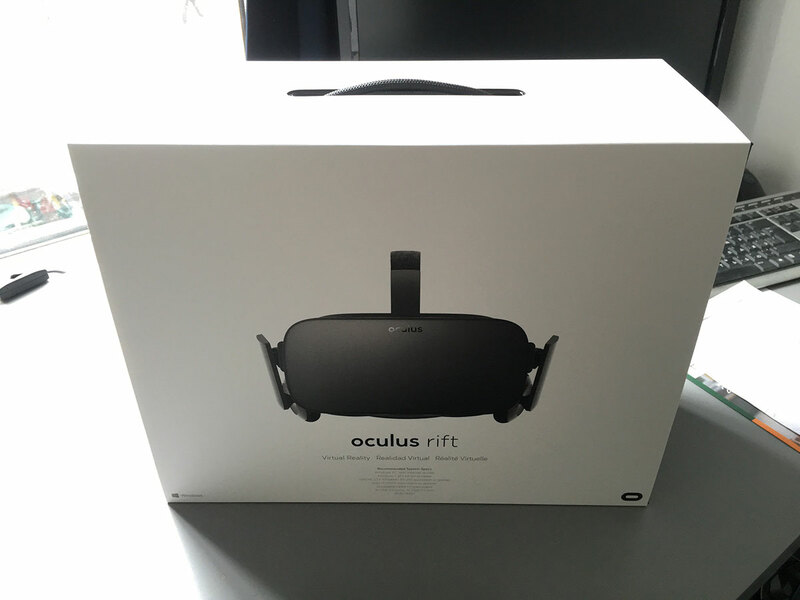 While in Amsterdam I’m getting notification from Oculus that “good news, we’re about to deliver your order, and going to charge you any moment now”. Next day they charged me and dispatched a note that headset will be delivered in the next couple of days. Next thing I know there’s notification from UPS with tracking number. You can actually postpone or even redirect delivery of a parcel on the UPS site. Alas to do so you have to register and confirm your address by receiving a mail with a secret code in it. So no, I could not postpone or cancel the delivery before they would try and deliver it first. One more day later I get notified that UPS tried to deliver, nobody was home, and - phew - they didn’t leave the package with neighbours or in the bushes, but brought it back to the UPS pick up point, where it was waiting for me. My PC is from 2010. It is pretty decent. Back at a time, it scored the fastest consumer grade graphics card on the market, astonishing 12Gb of RAM and Intel i7 quad core CPU. I vividly remember buying it so I could finally play Fallout 3. Last November we got Fallout 4 out, and it refused to launch. The reason being that Nvidia GTX 295 graphics card is not cool anymore. “Not a problem,” I thought and upgraded it to GTX 980. Nvidia site also listed GTX 970 as a bare minimum for VR. Fallout 4 launcher tested new system and set all settings to ultra quality. Gaming never looked better on that PC. I’ve also upgraded the main hard drive to SSD and added extra USB 3 ports. The only thing that Oculus currently complains about is CPU. Recommended CPU is Intel i5-6400. However, CPU is probably the only part on a PC that is almost impossible to upgrade. You’d have to change motherboard then, and at this point, you might as well buy a new PC with components tested and fit together. For now, I’m sticking with my Intel i7. Especially since it doesn’t seem to matter now, with GTX 980 taking most of the load. There aren’t many parts in the Oculus box. In addition to the headset, you’ll get the tracking sensor, Xbox controller and an Oculus remote - basically a simplified controller. Tracking sensor is expected to be placed on the table in front of yourself. 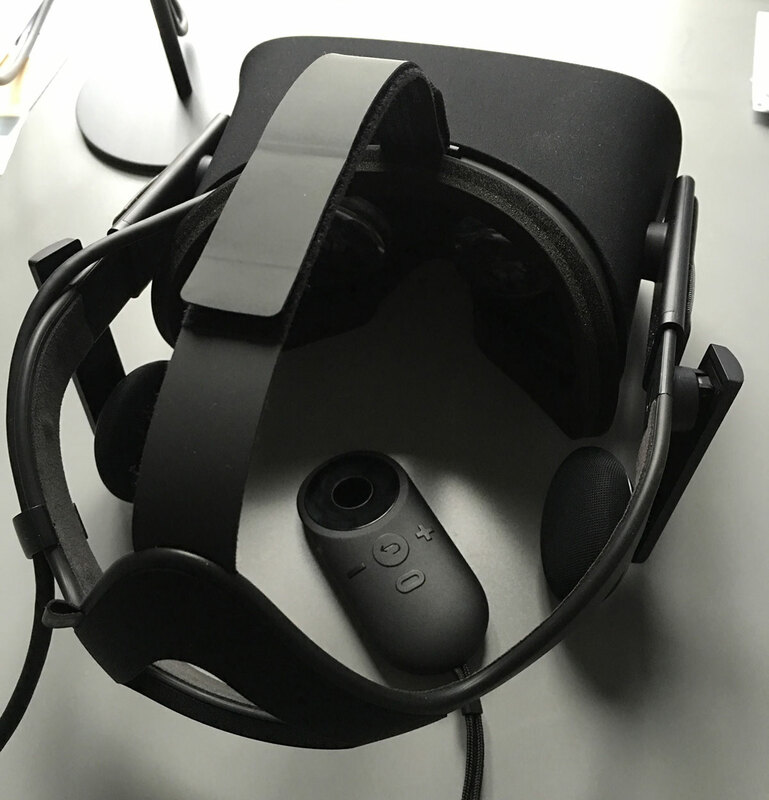 There’s guided installation from Oculus that will get you all setup. For me it just worked, cables got connected and devices got recognised. The biggest trouble was getting Xbox controller paired with the USB stick. After that, you put the headset on, and the magic begins. Oculus Home is a Steam-like piece of software that you get out of the box. There you can browse your library, buy stuff, download, and potentially chat with friends (I still have none). It is slowly evolving, they are bringing new features into it. Oculus Home is a proper VR app where you can remain and do stuff, and switch from one experience to another while fully immersed in VR. There is also a desktop version, much less amazing. Oculus Home will be the primary entry point for getting and consuming content. They are also bringing Oculus exclusives that are only available there, and only for Oculus. Eve Valkyrie is one example, Chronos is another. I was generally amazed how you can switch between apps comfortably, without a need to get the headset off. Before with DK1 and DK2 you would download an experience, try to launch it, and with some degree of success, you’d get it working on a screen and only then you’d put a headset on. With CV1 headset is no longer a secondary or mirrored screen. It is a separate device. This also means that some of the older DK2 experiences are no longer functioning properly with CV1. Oculus Home and Steam are the two places where you can get content for Oculus VR. Oculus Home is something you’ll get out of the box, and will be somewhat ushered to use as a primary store. There’s nothing wrong with that. You can buy games, software, and potentially films in the future. You also get a good deal of free content, some of which will be bundled with your headset. Drivers for both headset and Oculus controller will be updated via Oculus Home. It will also provide access to early concepts and demos, most of which you can get for free. My only problem with Oculus Home at the moment is prices. Most of the exclusive games currently cost around £40 with no discounts in sight. This is where Steam comes in. Steam is a clunky ancient piece of software that is good at one thing - discounts. Another thing that Steam can do well is refunds. If you buy a game, play it for a few minutes, and decide it is not fun - you can apply for a refund and within one day you most likely to get it. Refunds are somewhat critical when we talk about VR content. You see, with VR it is very personal. What is fine for one person will make another person feel sick. An action is no longer happening on a remote screen while you are controlling it from a distance. You are immersed into it. And you want to feel good while being in there. Not many studios get VR UX today. Some do it better than others. In many cases, it is hit or miss. Hence refunds. It is super fun to try lots of things from the catalogue, as long as you can return the product back on a shelf and get your money. This is not the case with Oculus Home, and some people are furious about this. Another killer feature that has absolutely no relation to VR in Steam is the ability to pay with bitcoins. 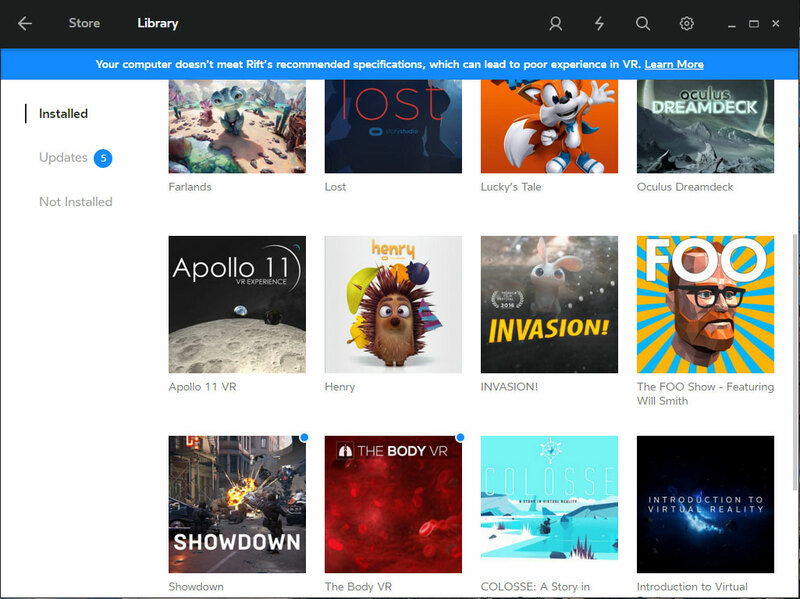 You can easily filter VR games in Steam. An important part is to remove HTC Vive tag and leave only Oculus compatible games. There are lots of incredibly awesome content for Vive, but all of it requires trackable controllers. Things will hopefully change towards the end of this year when Oculus releases Touch controllers. There is also the ongoing debate about DRM locking content to a certain kind of headset, with Oculus, I believe being the bad guys today. This might play out in a way that Vive users will never get Eve Valkyrie or Chronos, and it might swing the other way too by Valve locking Vive exclusives. Let’s hope this will be resolved in a friendly and calm manner. It truly depends on a content. Most games you’ll find in Oculus Home seems to be fine. It’s important to get the headset fit comfortably on your head. There is a certain sweet spot when the image is the sharpest and you almost don’t feel the pressure. Interocular distance is also important. Spend some time, adjust all the adjustables. After that putting headset on is incredibly easy and fast. So it’s down to the content. There are multiple issues that can cause uncomfortable feelings. They can be put there inadvertently or deliberately. In both cases, you’ll want to stop and get out. Head spinning. Can be caused by movements in the simulation of nature not anticipated by the brain. Our brain is pretty good at anticipating things and can incur actual physical feelings when all goes according to the plan. On the other hand, say, when you turn your head left but the picture turns right, the brain goes completely mental. This is also accompanied by the most bizarre physical sensations. Horror. Heavily amplified in VR, can be caused by quite non-threatening things when observed on the screen. It is also generally accompanied by feeling of helplessness since you don’t even have trackable motion controllers. Disgust. Again, can be caused by relatively harmless things that are heavily amplified by the feeling of presence. Sickness. I’ve had it only once, and it was in a flight simulator where the camera was attached directly to the plane. You could look around, but once the plane was spinning there were absolutely zero inertia involved - which you would normally have if you’d be flying inside the plane and had you head. Turned out inertia is a very important part of a comfortable VR flying experience. From what I played so far, here are some of the best experiences. A very simple looking game where you jump from one flying island to another. Somehow those guys got everything right. Feeling of propelling yourself through the air is incredible. Put a fan on the table for increased wow effect. You’ll need at least one another friend to play this one. It is also absolutely perfect for VR. You are the one immersed into a room with a ticking bomb nobody else can see. Your friends got instructions on how to disarm it. Go. Super fast futuristic racing game with techno music. This is how I’d imagine games in 2016 would be. Grid based dungeon crawler with a VR twist. You get a glowing sword in your hand. Wait, there is no hand, just a glowing sword hovering on a side. You can strike skeletons with it. Also, find keys, unlock loot and on some occasions hop onto the miner rail trolley. There will be lava. This one is not strictly speaking a game. It’s a historical simulation of a legendary mission with a documentary audio track and a very dramatic music. It is also one incredible package. I’ll just say one thing - when you are sitting in the command module, and the rocket is about to blast off - lean to the left and look out of the window. You can thank me for the hint and everyone at Oculus who invented trackable sensor. I’ve saved best for the last. Technolust is for the fans of Ready Player One and cyberpunk in general. It’s a sort of narrative with not so much shooting. Although, you will find yourself in the arcade full of games at some point. You’ll be able to jack into the classic arcades and experience all of them in VR. There are some technical issues with Technolust on Steam. If you haven’t got it via Oculus Home, there is a life hack - launch the game via good old .exe file in /steamapps. It’ll work just fine then. How bad are the lens flares? They can be annoying at the beginning, but then you don’t generally notice them. However, this heavily depends on the position of the headset and sweet spot. Once the headset is adjusted, the issue is much less noticeable. The issue here are fresnel lenses, and Oculus lenses apparently have smaller fragments, which liquidates chromatic aberrations, but introduces glares. Lenses are tricky business. They are one of the best usability features of the Oculus. Thanks to those, now you can put the headset on and off with a single sweeping move. One device on a head with everything you need for immersion. With both DK1 and DK2 there was alway that awkward dance when you put the headset on, then try to find headphones, then try to put those on too while figuring out the audio cable. There is a single cable now with CV1. It is long and feels durable. This is obviously a step towards something bigger. It is not the first step (which was DK1), but surely there is more to come. For me, I’d say better lenses and retina grade resolution. Lenses for resolving glares issue. 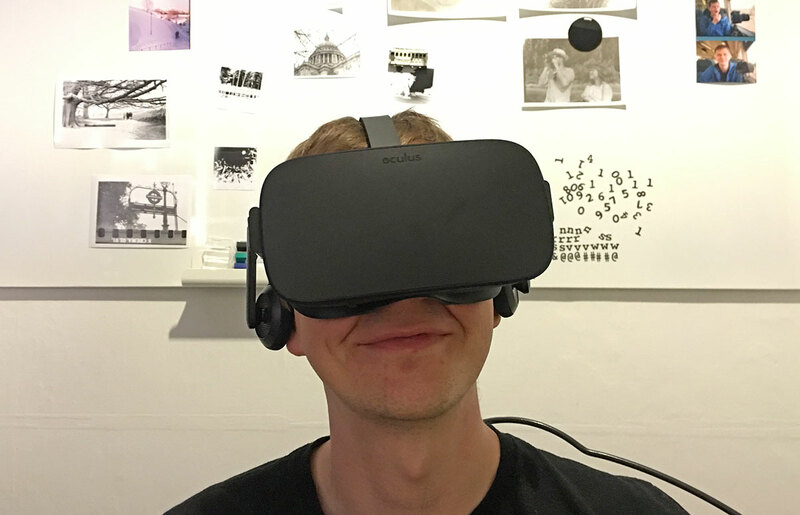 Better resolution for reading emails while in VR. You can do this now too, but you’d want to get an experience equivalent of having Macbook screen. Resolution is pretty decent today - for games, simulations and videos. I’d say it is not enough for precise work - whatever it might be. CV1 is a solid consumer product. They also did a great job by implementing Oculus Home. Yes, it is maybe DRM locked and evil. But it’s homey. There are pillows. They might let us walk around sometimes in the future. Collect trophies in games and put them on shelves. Oh, I’d love that very much. Your personal home with inflatable extra rooms. That is something of a dream. It is not perfect obviously, but it is a huge step towards accessible VR. Yes, you’ll need a powerful PC and Windows 10. This might change too - or they might actually come up with a backpack PC VR thingie. This post was not sponsored by Brompton. I bought it with my own money. 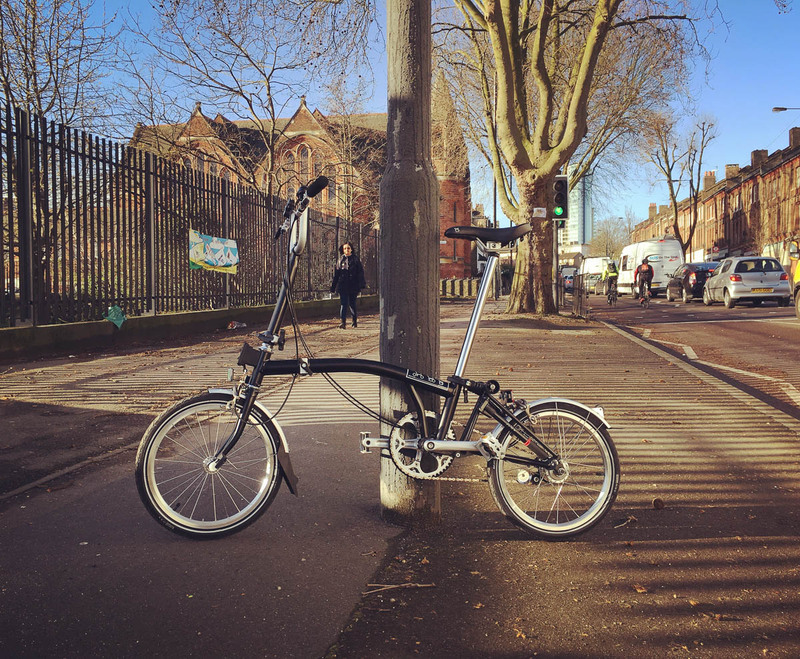 Brompton is a locally made brand of foldable bikes. They are praised for easy folding and tiny amount of required storage space. They are also very well built and suppose to last for years. I’be been biking all my life but never owned a foldable before. You can see Bromptons everywhere, often with well dressed people riding them around City. Because of a small size you are allowed to take it on board of tube and trains during rush hours. 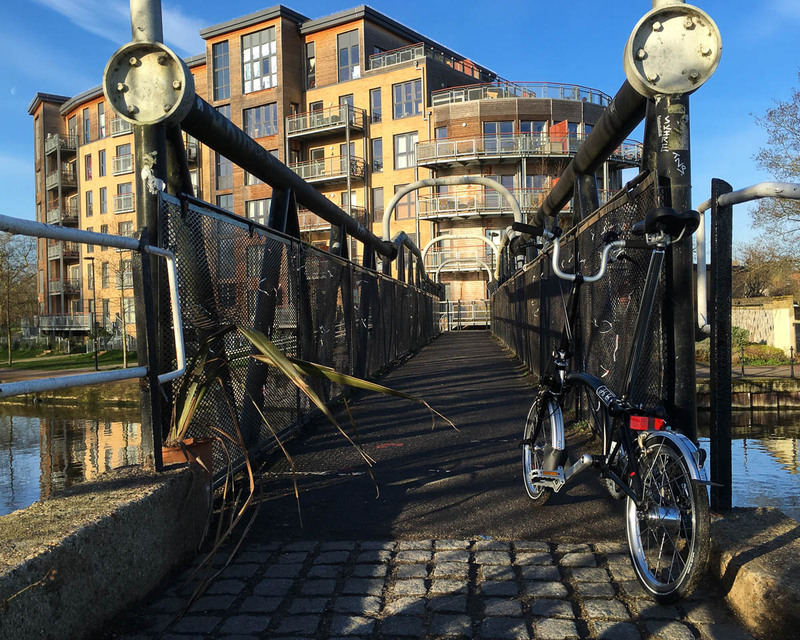 It can also be considered a proper last mile vehicle - more than often during bad weather I’d take a tube and then jump on a bike to quickly get to home from the final station. In March 2009, Brompton Bicycle achieved a record monthly turnover of just under £1 million; the employees were rewarded with fish and chips. The company is actually very small and very local. Original design was invented in 1976, and hasn’t really changed in the past 40 years. They increased amount of accessories, frame colours, and there is even optional titanium upgrade which will cost extra £600 and will make the whole thing about 0.74kg lighter. Everything is assembled in London from mostly unique parts. There’s also Brooks B17 special men’s and ladies optional saddle. Bromptons are pricey. Base models start at around £700, but with bare minimum set of options you are looking at £900. If you want a colourful body (as opposed to the basic black), and, say, original travel bag, it easily goes over a grand. I went with 3 speeds, mudguards and default black body set. Now, if you're a UK resident, there are couple of lifehacks that can provide you with a significant discount on a new bike. First is so called Cycle Scheme - a legit tax evasion scheme which can give you up to 40% back. There are a bunch of catches in order to qualify for one, but it is fairly popular way of getting a bike. Second option is related to private health insurance. Your employer might have you enrolled into one, and that insurance might offer you cashback on new bike. In both cases there is a hard limit of about £1000 for a full price of a bike. But that will give you a new Brompton. I ended up using health insurance cash back option. Biggest difference between those two is that with Cycle Scheme you don't need any money before you get a bike, while with health insurance cash back you have to pay full price upfront, and only then eventually they send you money back. You also own the bike from day 1. The bike is unlike anything I’ve ridden before. Proportions are vastly different from any conventional bike. Wheels are small. Steering feels very unsteady in the beginning. Pedalling with only one hand (or - look ma, no hands!) feels impossible. It is also fast. 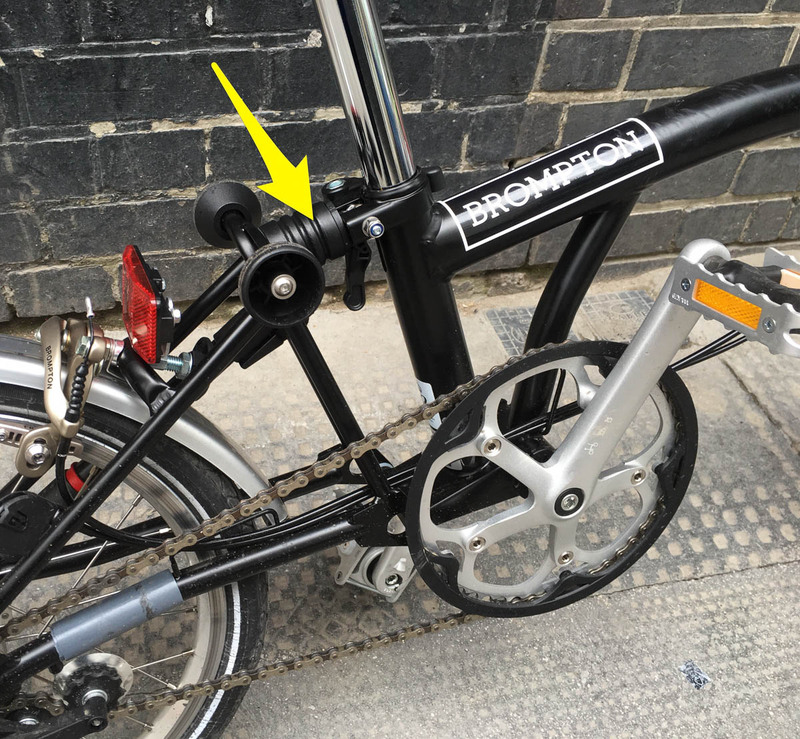 I’ve been hopping on and off the city bikes around London (they also feature 3 speeds), and by all means top speed of Brompton is much faster. Speed combined with unsteadiness and overall lightness of the bike is an explosive combination. If weather is particularly wet on a day, it becomes even less steady. You’d want to avoid pebble roads, old brick roads, and anything with uneven surfaces and ditches. When making sharp turns, there is a small chance of hitting ground with a pedal in lower position. It’s a nasty way of loosing your balance. Just like learning how to ride a bike, none of that will matter after a few weeks. I can even ride it with no hands now - not for too long. Except from pebbled roads - they are quite unforgivable and very uncomfortable to ride even in dry weather. This bike features a way of rolling it around when it is folded. There are 2 rolls behind the seat and one more small roll on a back mudguard. With those 3 rolls you can get folded bike rolled from one tube station to another. However, default wheels are not meant for prolonged use. They are very small, not very good at rolling, and any uneven surface will be a problem. 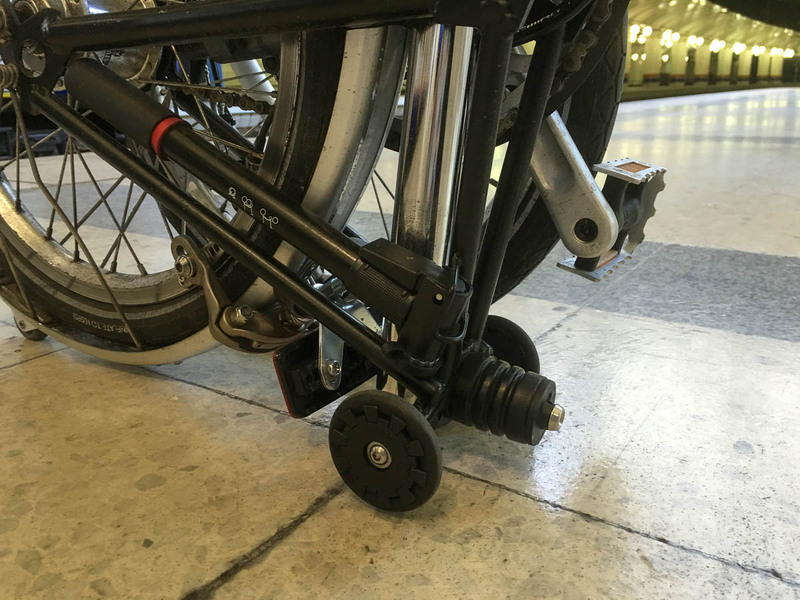 First time I was rolling folded bike around the tube stations, one of the locking pieces (which also is a suspension) broke away and was never found again (replacement cost: £12). What you can do is get better wheels. Apparently wheels from most rollerblades would fit just fine. I got official Brompton “Easy Wheels” for something like £20. They are larger and actually meant to be rolled. To be fair, I would expect them to be installed by default. The bike weight is around 11kg, and ability to roll it is very important. Train and tube stations in London are famous for being wheel chair unfriendly. They are full of stairs, sometimes circular stairs, long corridors, and, of course, crowds. 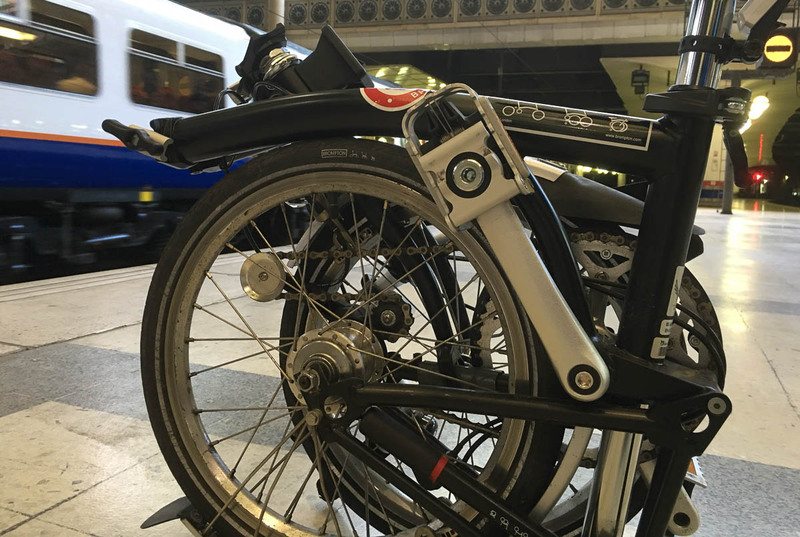 With foldable bike you suddenly get option to jump on a public transport whenever you feel like it. This in turn requires some technique. It is possible to carry the bike while folded as well as in full unfolded mode. Overground is relatively easy, there is much more space, platforms are large and there’s always that far side of the platform where nobody goes. Tube is trickier, but is doable even during rush hour. I find it easier to carry the bike in unfolded state by putting saddle on top of my shoulder. It is also much, much easier to roll around. I’d usually get as far as possible with unfolded bike, then fold it right before jumping into the train. 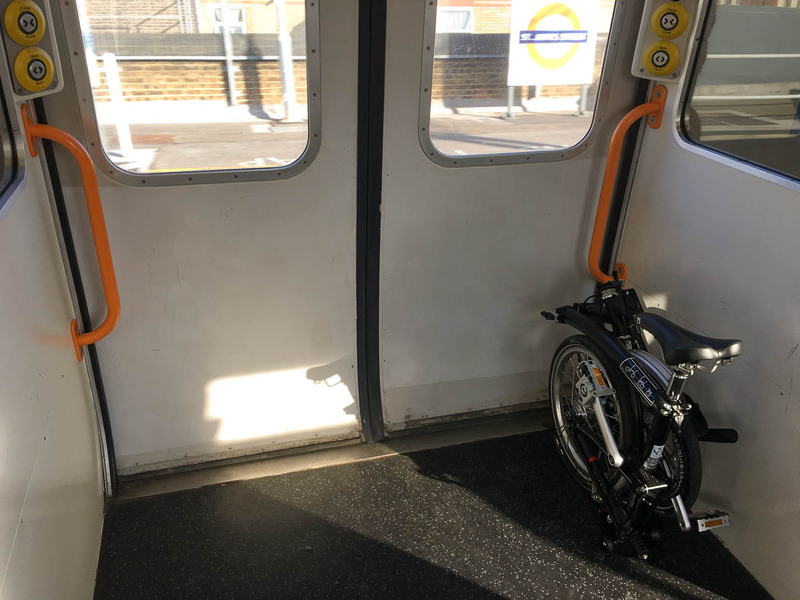 On overground trips it is also possible to unfold the bike inside a train right before arrival. Station staff will usually issue a friendly reminder that bike has to be folded during the journey. They will also help you get through the gates. It is technically possible to get through the narrow “pedestrian” gates, but they will start alarming as you are going through, thinking there are two persons trying to get in. No one really will care about the alarm, but it is annoying. “Luggage” gates are much more comfortable to use. The bike feels pretty solid, considering the amount of moving parts. All parts are well made and fit nicely together. My only complain is about speed switcher. Strangely it is made of what seems like cheap plastic. Switch itself becomes loose during the trip and starts making annoying sounds. Tyres are made of something called Brompton Kevlar. No punctures so far. And yes, there’s plenty of broken glass on roads in the city. 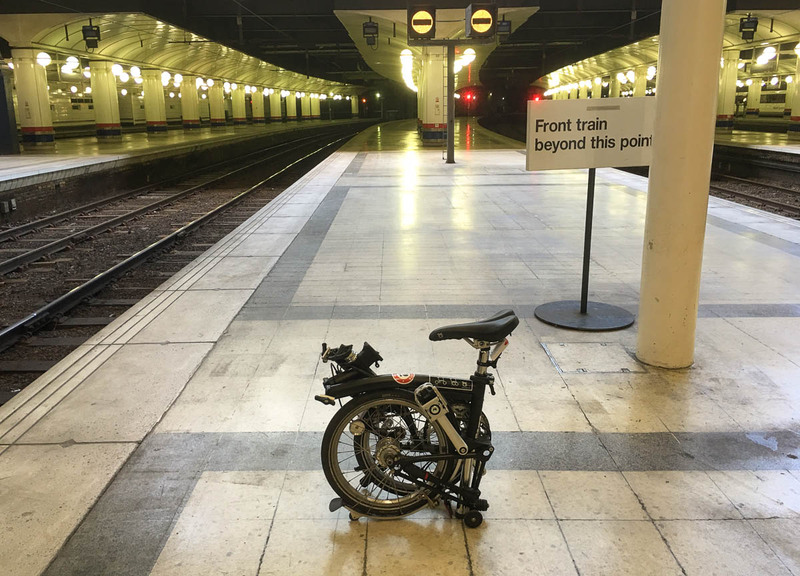 Here’s a video of a guy folding Brompton in just under 6 seconds. Takes me about 15 seconds to perform the same. Unfolding takes about the same time, if not faster. This is a big deal. You’d think that during the trip you would need to fold and unfold it maybe twice. In practice on a morning commute I’d go through this at least 4 times. There might be extra folding involved if I’m commuting to, let’s say, Charing Cross station - it is notorious for its super long tunnels connecting tube to the railways station. This way I’d unfold it while still underground, roll it around, fold it again, get on the escalator, and so on. Point is - when folding is not a pain but a very quick and painless operation you have no problem of doing it at the smallest convenience. My commute looks somewhat like this. It’s about 10km one way, with not much of hills. Central London is relatively flat. I’ve been commuting mornings on overground train + bike, and evenings pure bike. Goal is eventually to start biking both ways every day. I strongly feel that commute eats into your life, and there is nothing that can really compensate it. But if your commute is cycling, it is actually pretty awesome and doesn’t feel like commute at all. You’re also much more in control, unlike when on the train and it stops, and nothing happens for a long time. Time to cycle home is much more predictable than taking train. And don’t even get me started on the ticket prices. Daily cycling can save a significant amount of £. Brompton seems to be handling distances very well. It is strangely a solid bike for long distances. And by long distance I probably mean up to ~15km one way, which is my absolute mental limit for daily commute on a bike. Foldable bike in the city is like a Swiss knife to all sort of situations. It fits perfectly into life and for me it’s almost impossible now to imagine getting around without one. Ground traffic is always stuck, underground traffic is crowded and often broken. Cycling will actually get you around in reasonable time, and you get to spot fresh street art of Shoreditch area. Not only in city - on weekend I’d often go to my dropzone in a small village in Kent. There is this hugely annoying and plain dangerous part when you walk from the train station to the airdrome - about 30 min of walk on a narrow British road with cars whizzing past yourself. Bike changed everything - 10 min of pedalling and I’m there, signing my name on a flight manifest. It takes some time to get used to steering and riding one. I’d also wish they put better mini-wheels for rolling it by default. And better switch for gears - something more solid and easy to switch. I also greatly miss some sort of standing support. It is impossible to leave unfolded bike for a second while buying cup of coffee - you have to find a wall to put it against, and even then it will somehow roll and crash to the ground. Some sort of an extra leg would be amazing. In all the fairness, London offers excellent city bike scheme where you don’t even have to buy your bike - there are hundreds of stations with large, indestructible bikes ready to be borrowed. I was using it for 2 years for commuting. Unfortunately they are only available in zones 1 and 2, and since then we have moved to zone 3. Still, I’m happy to have my own bike now. And I can carry it anywhere. We’re back from the Netherlands. 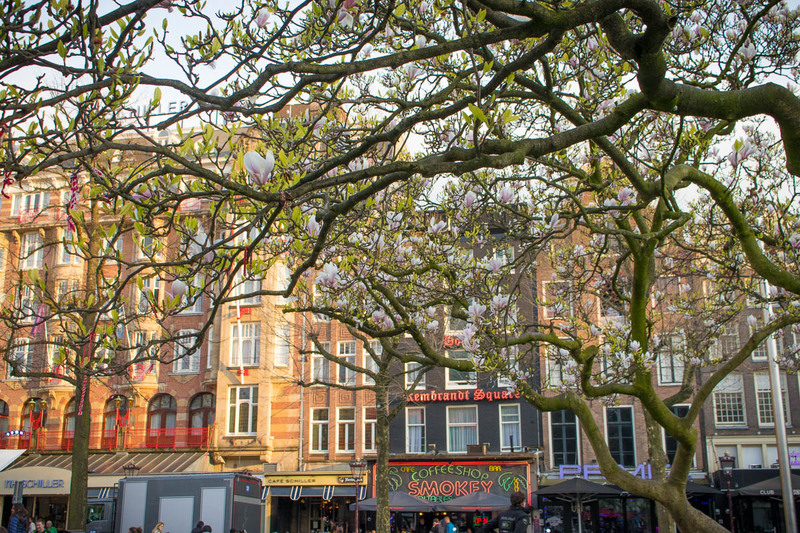 Our base was in Amsterdam, but we also managed to get out of town and travel to a few locations around that beautiful country. For one week I also made daily video log episodes, all of which are now available for watching. As usual, everything is filmed, cut and released during the same day. We get through the morning rush hour in London to catch a train to Gatwick, then hop on the plane and land in Amsterdam Schilpol airport. Quick travel to our AirBnb location in Spaklerweg, and then evening in the town. We try (second) best potato fries in town, stroll along the channels and see the thunderstorm in the night.